Follys party vibe and Mardi Gras go together like red beans and rice, dont you think? The sixth annual Folly Gras will be this Saturday, February 9. Come on out for all the beads, masks, and New Orleansstyle food and drinks from your favorite Folly restaurants. Center Street will be closed from 12 to 5 p.m.
Of course, Mardi Gras attire is encouraged, and masks can be purchased on the second floor of city hall. Each mask is $3.00, is available on a first-come-first-served basis, and beads will be given with each mask. Be sure to ask for Mary. And because no Folly Gras is complete without it, be ready for live music from the Shakin Martinis, Soul Fish, Davis Coen Blues Band, Gaslight Streets, and the Guilt Ridden Troubadours. Stages will be set up in several locations up and down Center Street. The traditional Folly Gras parade will begin at 2 p.m. in front of the Tides Hotel and will continue down Center Street to East Hudson Avenue. If you want to walk in the parade, remember that you must be in Mardi Gras costume to participate. Decorated pets are more than welcome. Cars are allowed only if they are completely decorated. Floats, golf carts, and alternative transportation are encouraged. And trucks are allowed if they are pulling a float. Meet on West Arctic by 1:30 p.m. to line up to march. There will be awards to add to the fun. 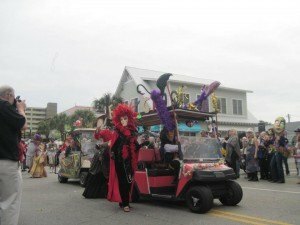 Parade participants are eligible for the Best All Around Folly Gras Spirit, Best Golf Cart, and Best Costume. And food vendors will compete for Best New Orleans Food Fare, and first, second, and third prizes will be awarded. It might not be New Orleans, but Folly Beach promises a Mardi Gras to remember. Yes, dogs on leashes are permitted at this event. What about a miniature horse in parade? He is a pet! can we bring dogs on leashes?